Jaylon Wilson, a 17-year old boy who lives on Westwood between W. Warren Ave. and Sawyer in the Warrendale neighborhood of Detroit, was kidnapped from his home yesterday afternoon. He was reportedly abducted at approximately 12:30 p.m. from the side of a home. The teen was seen with three males in an older-model silver Chevy Impala or Malibu driven by a female, according to sources within the Detroit Police Department. Detectives described the three individuals in this car as African-American and said one of them had dreadlocks. Unfortunately, additional details are not available at available. The Detroit Police Department is investigating a shooting that happened on Ashton, near Tireman, at the northern end of the Warrendale neighborhood, early this morning. This shooting reportedly happened at approximately 4 a.m. this morning. According to published news reports, Detroit police officers were in the area when they heard a series of gunshots. After racing to the scene, responding officers discovered an unidentified individual shot inside of an automobile. Two individuals were seen fleeing from that location as police approached. An investigation into this shooting is ongoing. The two individuals who fled from the scene are wanted for questioning in connection to it. Anyone with information about this tragedy is asked to contact the Detroit Police Department. Fox 2 Detroit has more in their story, embedded above. A friend of mine posted a question on Facebook that I wanted to repeat here. He asked, "What's your pick for most essential experience to have in Detroit if you're here for just one awesome day?" Most people responded things like Eastern Market, the RiverWalk, Campus Martius Park, and so on. A few people suggested experiences like taking in a Detroit Tigers. Lions, Pistons, or Red Wings game (depending on the season when this awesome day is supposed to happen). Quite frankly, I told my friend, I was reminded of what a park ranger replied when someone asked what he would do if he only had one day at Yosemite National Park. According to legend, the park ranger thought for a moment before declaring, "if I came all the way here and could only stay for one day, I'd probably just sit right down on that bench over there and cry." But, yeah - any of those other responses work. too. I want to take a moment to wish a happy 4th of July to everyone in the Warrendale neighborhood and beyond. Fireworks are bursting across Detroit (perhaps too frequently). Barbecues are warming up. Parks like Rouge Park, Belle Isle, and others are busy. 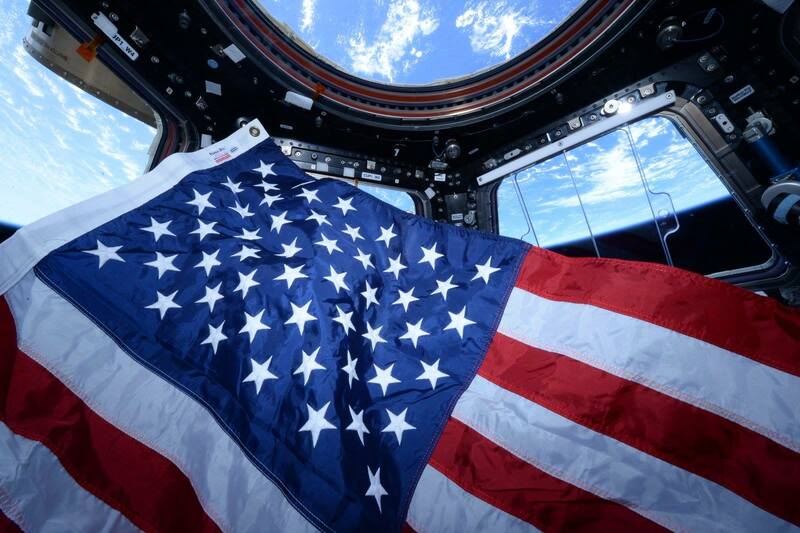 Flags are waving, including aboard the International Space Station. 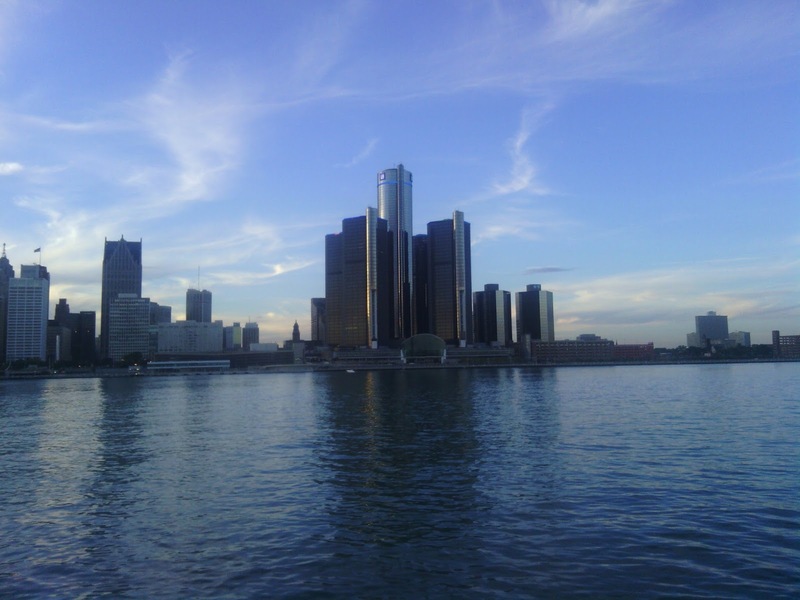 Detroiters, without question, are busy celebrating the 241st birthday of this great nation. Is anyone in the neighborhood missing a rooster? I ask because one has shown up in the vicinity of Paul and Warwick Streets. It does seem a bit odd. Yes, I did say a rooster. Yes, it is here in Detroit. 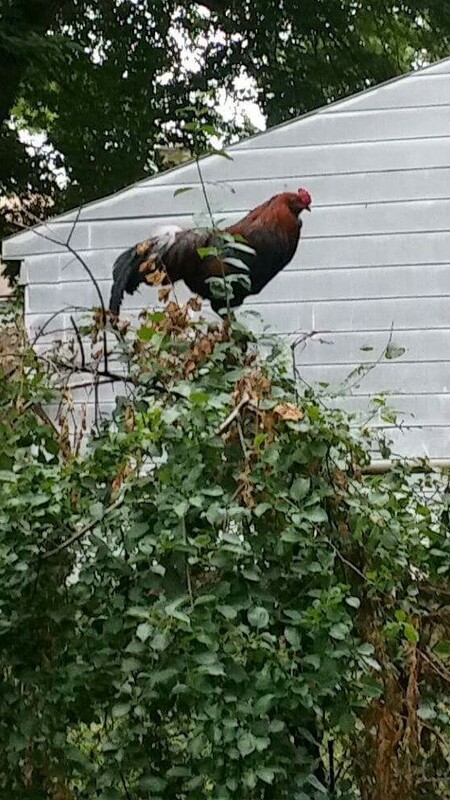 This, by the way, isn't the first time that a rooster has been seen in the Warrendale neighborhood of Detroit, although the last time was almost 11 years ago. The folks over at Animal Corner tell me that the average lifespan of a chicken is only 5 -7 years so I doubt it is the same bird returning for another photo op. Still, it is most unusual to see a rooster wandering free in the streets of Detroit. I'm just glad that someone sent me a photo of it while he's here. The long holiday weekend is upon us. While others flock to the beach or leave town altogether, I'm in my backyard reading an advanced copy of Wychwood by The Sunday Times bestselling author George Mann. I'm only a few pages into this novel, but like it a lot so far. I will have a full review on this blog soon. Until then, I hope that everyone is having an amazing 4th of July weekend no matter what it is you do.